I LOVE giving people gifts. I’ve always prided myself as a pretty creative gifter. Maybe that’s because I pay attention to people more than most others do….well that sounds a little creepy. Last year, I crocheted 7 infinity scarves for my close friends and family, each tailored with their favorite color. This allowed me to watch horribly-entertaining shows on Netflix for hours on end. And I wanted to set fire to all of my yarn only a few times! Success. (Minus the fact that one of my good friends turned out to be allergic to the baby alpaca yarn I made her scarf with and ended up with a lovely red rash around her neck…sorry, Laura) To make all of these, I started back in October. This year, 4 days until Christmas, and I haven’t even started my gift-making-extravaganza yet. For the next few days, I will be feverishly working on gift baskets, which will include homemade chapstick, whipped body butter, relaxing bath salts and invigorating sugar scrubs. I have very few of the ingredients I need for all of this, so additionally I will have to brave the psycho-crazy-last-minute shoppers. And I will be one of them. There are a few gifts that I have completed so far, however. This year, I decided to let the gift keep on giving even after Christmas: potted paperwhite lilies that will bloom (hopefully) sometime in January. It was very easy to do, and fairly cheap for as many as I made. 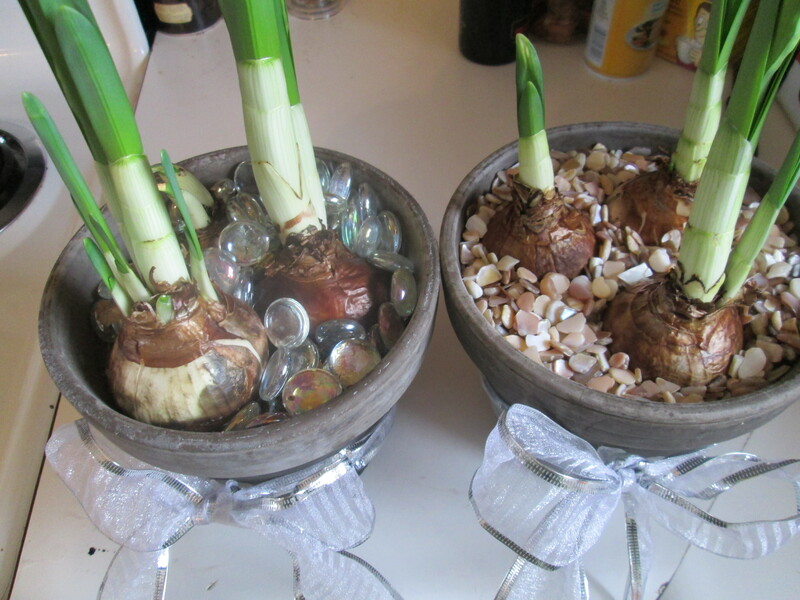 All you need are paperwhite lily bulbs, potting soil and a flower pot really. 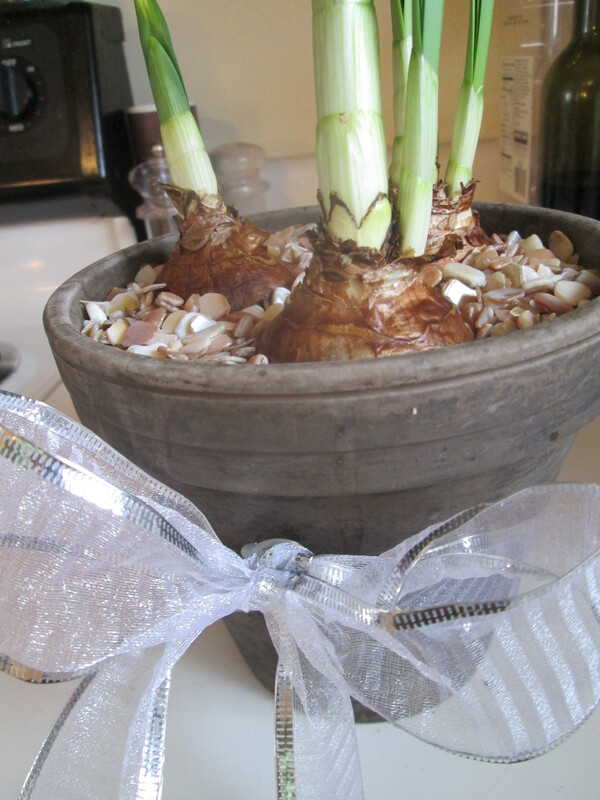 If you want to fancy-it-up you can wrap the pots with ribbon, or even decorate them. 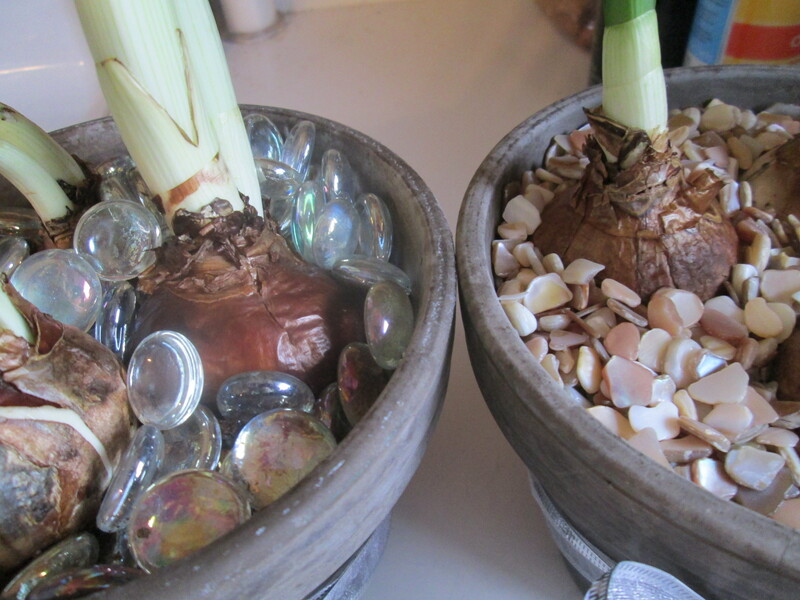 You can also top the potting soil with decorative shells or beads of different colors. 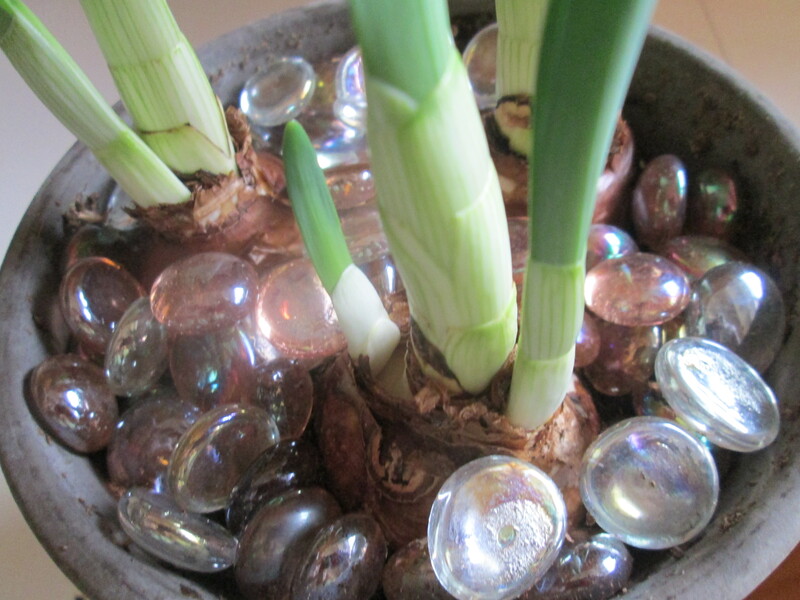 I put 3 bulbs to a flower pot. You can do less, or more if the pots are bigger. I wrapped the flower pots with ribbon and included some fun shells and beads on top of the soil. Instead of decorating the pots, I’m going to write the names of the people I’m giving them to on the pot with chalk. The chalk will eventually come off, or can be washed off, and they can reuse the pot for flowers in the summer if they wish. Although I thought this was a fun idea, one remark I got was: ‘You made a gift for someone to finish doing all the work on…’ Ya, well, I figured they needed a new hobby as well. I’m thoughtful like that dammit. Another gift idea I had involves booze. ….no one is shocked…. One of my roommates is really in to beer. She loves everything about it, especially trying new ones. 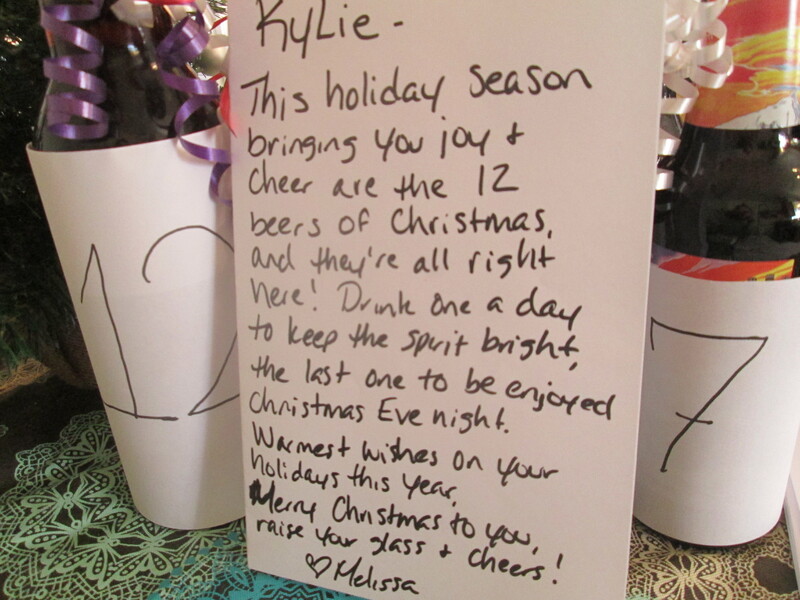 So, in a bout of cleverness, I decided to give her the 12 Beers of Christmas. 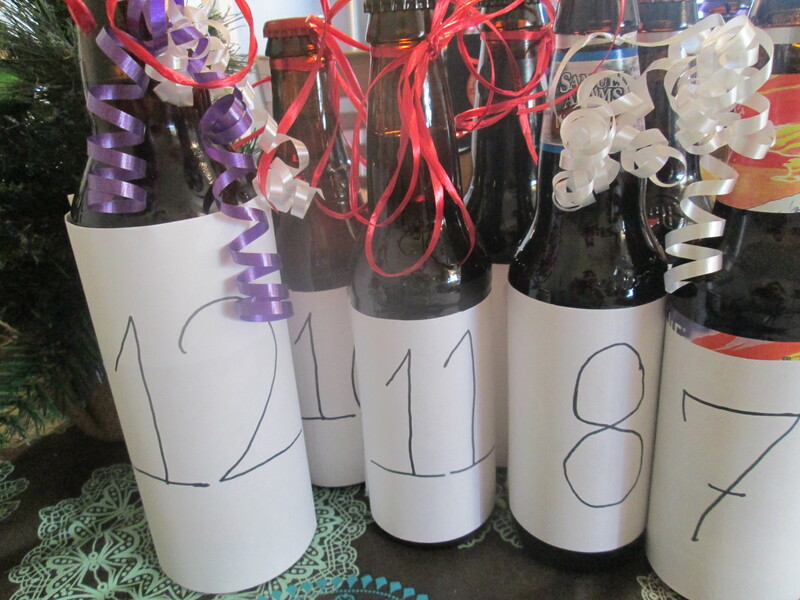 I bought 12 different singles and wrapped each of them with white paper, writing the number order in which to drink the beers. One a day for 12 days, with the last one to be opened Christmas Eve. Each one I bought was a special seasonal, and no two were from the same brewery, including the bomber I bought for Day 12. I finished off each one with a festive ribbon, which I successfully curled without ruining it. And then I wrote a poem to accompany them. As for the rest of my brilliant Christmas gift ideas….well, they may turn out to be New Year gifts instead. What better way to ring in the New Year than with a present?! Maybe that was my plan all along. This entry was posted in Arts & Crafts, DIY, Gardening, Homemade Gifts, Lip Dressing and tagged arts & crafts, bath salts, Christmas, DIY, Gifts, homemade, lip dressing, sugar scrub, trial & error. Bookmark the permalink.